In 2019, Creative Industries Fund NL and the Mondriaan Fund are once again jointly offering two residency periods in the Japanese ceramics region of Saga. The funds invite designers and artists to submit a proposal by 6 august 2018 at the latest. This Open Call has ended. The residency in Japan offers highly promising artists and designers the leeway to conduct artistic and technical research and to develop their personal work, which must also lead to intensive interaction with the relevant porcelain manufacturers in the region. An important guiding principle for this residency is to learn special techniques within Japan's oldest ceramics industry and employ them in their own work. The highly particular Arita porcelain is renowned for its superior quality, most notably the hand-painting it involves. The porcelain industry and the tradition of porcelain painting has existed since 1616. Arita is a small town in the Saga prefecture on Kyushu, which is Japan's third largest island. The Dutch designer duo Scholten & Baijings and Japanese designer Teruhiro Yanagihara are involved with this celebration as artistic directors of the Arita 2016 project. They have established this residency in association with the Mondriaan Fund and Creative Industries Fund NL in order to stimulate crossovers and experimentation, as well as to initiate new collaborations between Dutch artists & designers and Japanese potteries. Designers Jan Broekstra, Floris Wubben and artists Henri Jacobs and Ruta Butkute de Roo stayed at the Arita residence in 2016. In 2017, artists Susan Kooi and Helen Frik and designers Tijmen Smeulders and Aliki van der Kruis worked there. In the summer of 2018 designers Bas van Beek, Franciska Meijers and artists Tilmann Meyer-Faje and Isabel Ferrand will stay in Saga for three months. The residency can be applied for only by visual artists (via the Mondriaan Fund) or designers (via Creative Industries Fund NL). For applications by duos or cooperatives, each individual involved must submit a separate application. A duo is understood as two artists or designers who produce work together on a structural basis. Duos (project-specific or longer-term) are regarded as collaborations if they submit a joint plan that leads to a single outcome for the work period. In addition, a duo must be prepared to live and work in a single, somewhat confined space. The artists/designers are expected to possess some basic knowledge of working with ceramics. There is no need for a concrete project proposal, but a good description of plans and ideas that the applicant wants to execute during the work period. Your preferred residency period should be indicated in your application. If possible, this preference will be respected. A sum of €9,500 is available for travel, materials and transportation expenses for each period. The residents should reserve €1,500 to remunerate the potters for their guidance during the work process. The costs of the studio, the living space and support will be paid directly to Arita by the Dutch Embassy in Tokyo. Before the work period begins, Scholten & Baijings and Teruhiro Yanagihara will pair the residents with one of the ten participating potteries in Arita. 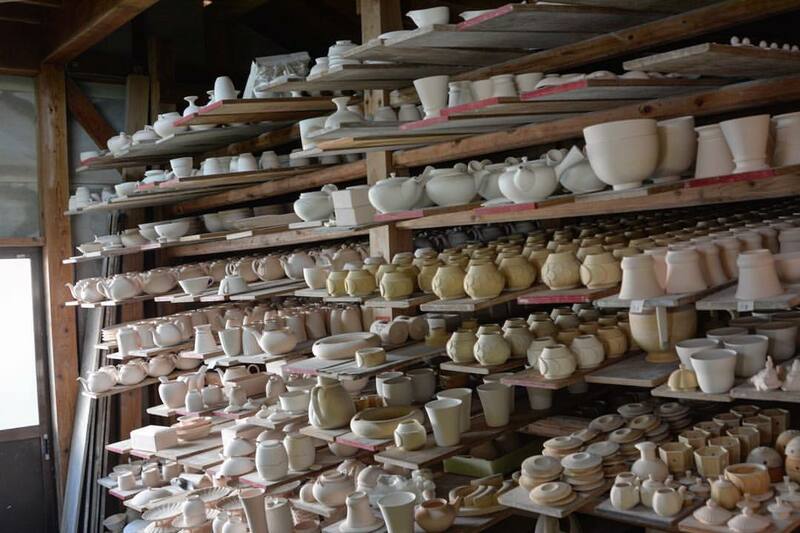 This pottery is also the point of contact when seeking technical support from the Ceramic Technical Research Laboratory in Arita. An assistant/translator is available to help the residents for several hours per week, in discussions with the potteries and other practical matters. An artist and a designer work in Arita for each period. The residents stay in a traditional Japanese house where they each have their own room. The living room, bathroom and kitchen are shared. The experiences and results of the residency will be shared in Arita and later in the Netherlands by means of lectures and/or workshops. the applicant's motivation in relation to the location (max. four A4 pages). In all cases the committee advises first and foremost about the artistic quality of the portfolio. It then advises about the motivation and the plans in relation to the location. The proposal can be submitted via the Fund's online application environment. 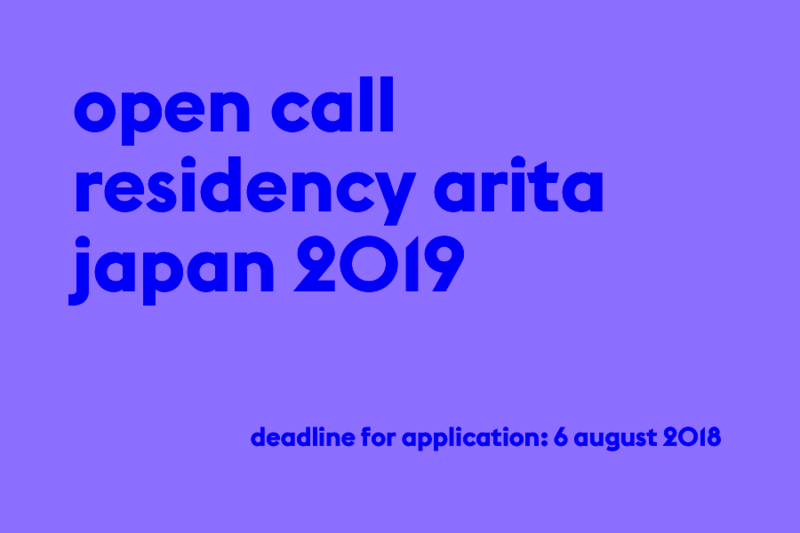 Select the round 'Open Call Residency Arita, Japan 2019'. The available places can only be allocated if the advisory committee's advice with regard to the abovementioned criteria is positive. The committee may apply a prioritization. For further information about this Open Call, please contact Hugo van de Poel via h.vandepoel@stimuleringsfonds.nl or via tel. +31(0)10 436 1600.